Chelsea defender David Luiz has revealed that Barcelona came in with an offer for his services in the summer transfer window. The Brazilian international was the subject of plenty of transfer speculation with German giants Bayern Munich also showing interest but he opted to remain with Chelsea even after Barca lodged a £21.5million bid. 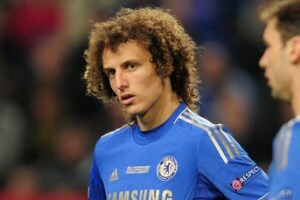 “There was an official offer [from Barcelona] but I decided to stay at Chelsea,” Luiz told reporters while away on international duty.